Cognitive Diversity is your way to bring in new perspectives and ideas. Diversity is a tricky word. The truth is that diversity carries many aspects that interact with each other and with their environment. We usually link diversity with gender, ethnicity or age representation, which is correct but there are others. Many companies are reaping the benefits of an inclusive workforce with a proper representation. However, there’s another side of diversity that businesses might be passing: cognitive diversity. Cognitive Diversity is the representation of different ways of thinking, different mindsets and different skills sets. The concept comes from the differences in perspective and information processing. Therefore does not directly involves factors such as gender or ethnicity. However, the two concepts often end up intertwining. It’s important that we distinguish but also connect these two faces of diversity. Inclusiveness and proper representations are necessary. A handful of different skills, problem solvers, points of views is a plus. 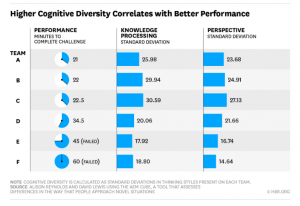 Cognitive diversity gives you a competitive advantage. It is of course more comfortable to interact with people that think alike. We talked here about affinity bias when we are more likely to get close to people with whom we have an affinity. However, if you keep to your comfort zone you won’t get too far. The reason is simple: if you get people that think the same, you will get more of the same. Harvard Business Review (HBR) developed an experiment about Cognitive Diversity in the workplace and how it affects performances. They analyzed six teams and the one with the highest diversity of thinking was the best performer. You can check the full video by clicking on the graph. The results just makes sense. The more diverse the knowledge and skills you have around you, the faster you will pass new challenges. It is definitely easier to measure diversity by social background, ethnicity, age, gender. We can’t check how someone thinks or processes information from the outside. Cognitive diversity can be challenging as it deals with internal characteristics that might take time to surface it. Our unconscious bias can create barriers that restrict our cognitive diversity. Remember we mentioned affinity bias earlier? There’s a similar one called functional bias when companies have low cognitive diversity. It happens when teams are facing new complex situations and they struggle to come up with different solutions and ideas. Cognitive Diversity it’s an opportunity for people to learn, communicate and interact with people of different mindsets. It has a direct impact on businesses as you’re encouraging your people to develop new skills and new solutions. Also, it has been proven by HBR to boost performance and creativity. Assign different roles to different people according to each project or campaign. You’re stimulating your team to try different abilities and to think outside the box. The talent is in the difference. Expand your network by connecting with different teams. A good example is to brainstorm and mix up with different teams, different departments or even from different companies. 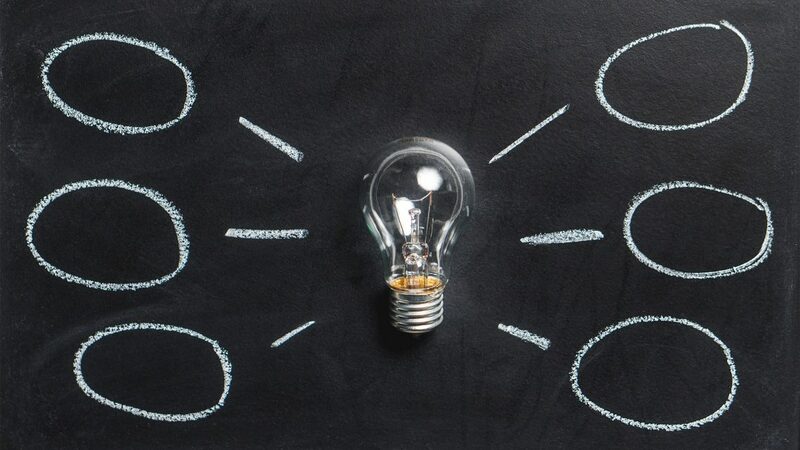 It’s a good way to get new insights and to promote communication within different ideas.